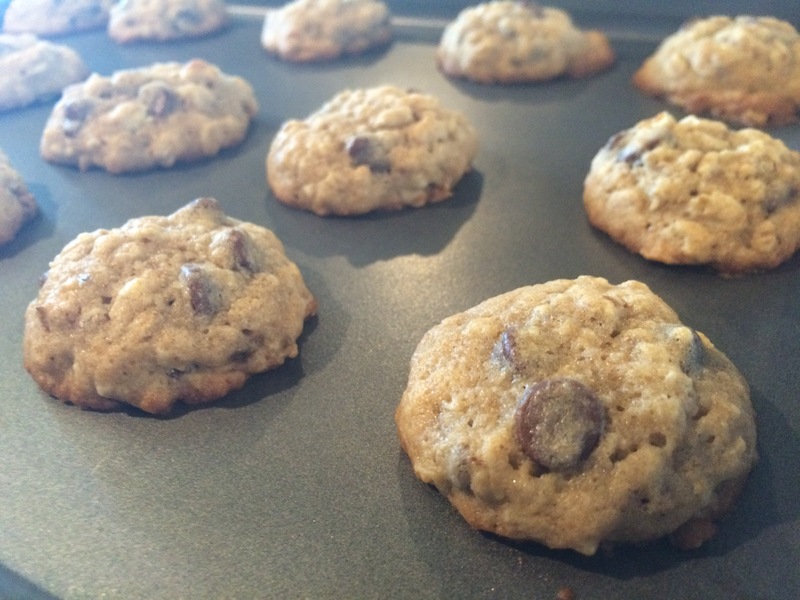 I am always looking for new cookie recipes to try, especially ones that sneak in some healthy stuff but are still delicious. This week, I tried a recipe from Martha Stewart that blew me away. These cookies are phenomenal. 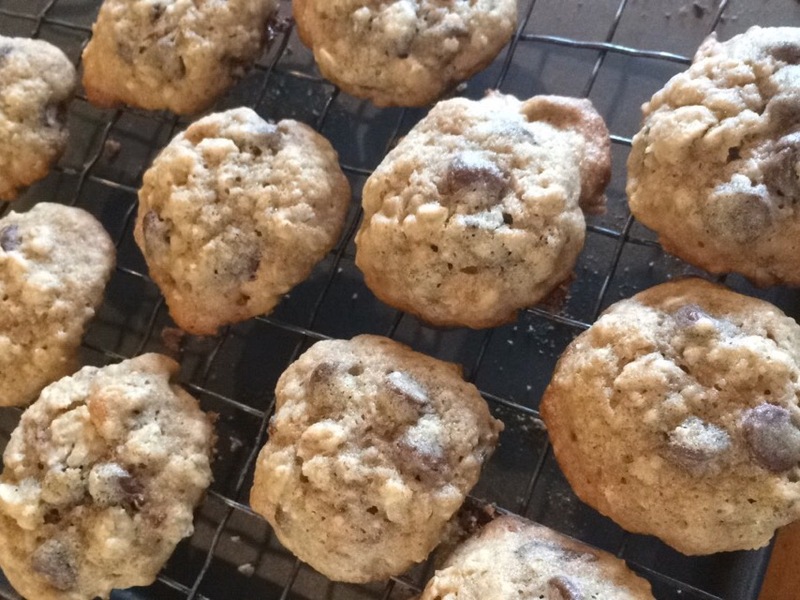 Imagine you combined a banana bread with an oatmeal chocolate chip cookie. The banana flavor is not too strong, the old-fashioned oats and walnuts give them a nice crunch and who doesn’t love chocolate? I really liked these cookies. I know you will too! Preheat oven to 375 degrees. Whisk together flours, salt, and baking soda in a small bowl; set aside. Put butter and sugars into the bowl of an electric mixer fitted with the paddle attachment. Mix on medium speed until pale and fluffy. Reduce speed to low. Add egg and vanilla. Mix until combined. Mix in banana. Add flour mixture. Mix until just combined. 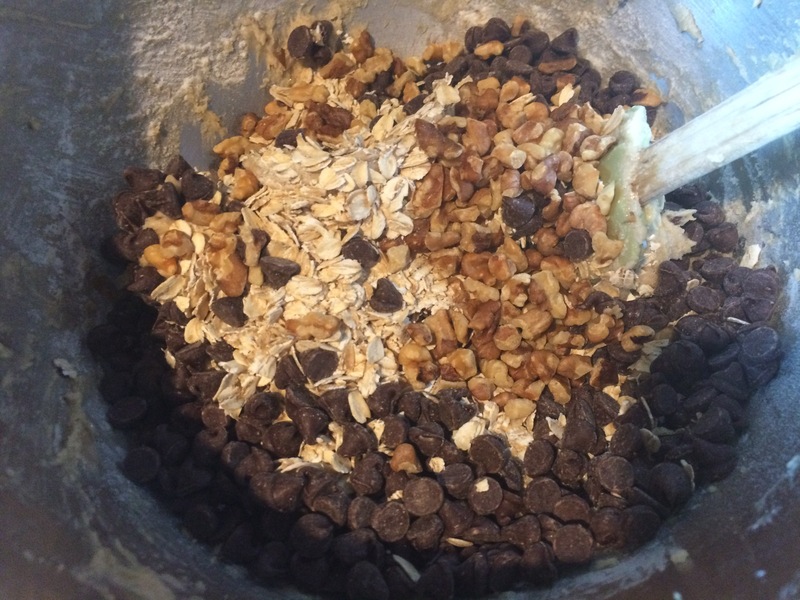 Stir in oats, chocolate chunks, and walnuts. Using a 2 tsp disher, drop dough onto baking sheets lined with parchment paper (or roll into balls about one inch in diameter) spacing about 2 inches apart. Bake cookies, rotating sheets halfway through, until golden brown and just set, about 9 minutes. Let cool on sheets on wire racks 5 minutes. Transfer cookies to wire racks; let cool completely. Cookies can be stored in airtight containers up to 2 days.